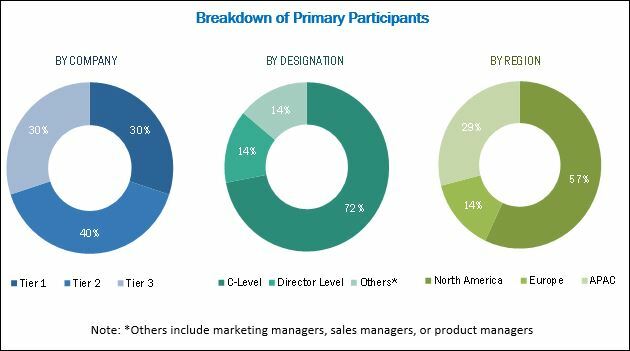 [186 Pages Report] The Location-Based Services (LBS) and Real-Time Location Systems (RTLS) market size was valued at USD 17.38 billion in 2017 and is projected to reach USD 68.85 billion by 2023, at a Compound Annual Growth Rate (CAGR) of 25.4% during the forecast period. The base year considered for the study is 2017 and the forecast period is from 2018 to 2023. The main objective of the report is to define, describe, and forecast the LBS and RTLS market size based on components (software, services, and hardware), location types (outdoor and indoor), software (geocoding and reverse geocoding, location and predictive analytics, reporting and visualization, database management and spatial Extract, Transform, and Load (ETL), and risk analytics and threat prevention), services (deployment and integration, application support and maintenance, and consulting and advisory), verticals, and regions. The report provides detailed information on the major factors (drivers, restraints, opportunities, and challenges) influencing the market growth. The report attempts to forecast the market size with respect to 5 main regions, namely, North America, Asia Pacific (APAC), Europe, Latin America, and Middle East and Africa (MEA). The report strategically profiles the key market players and comprehensively analyzes their core competencies. Moreover, it tracks and analyzes competitive developments such as joint ventures, mergers and acquisitions, and new product developments, in the LBS and RTLS market. The LBS and RTLS market includes various vendors providing solutions and services to commercial clients across the globe. The companies such as Cisco (US), Google (US), IBM (US), Microsoft (US), Oracle (US), TomTom (Netherlands), Apple (US), Esri (US), Ericsson (Sweden), Qualcomm (US), Zebra (US), Ubisense (UK), Pitney Bowes (US), Baidu (China), Foursquare (US), Centrak (US), Ekahau (US), Galigeo (France), HERE (Netherlands), Teldio (Canada), Navigine (US), Living Map (UK), infsoft (Germany), AiRISTA (Maryland), and Quuppa (Finland) have adopted partnerships, agreements, and collaborations as the key strategies to enhance their market reach. The study answers several questions for the stakeholders, such as which market segments to focus on in the next 2–5 years to prioritize efforts and investments. 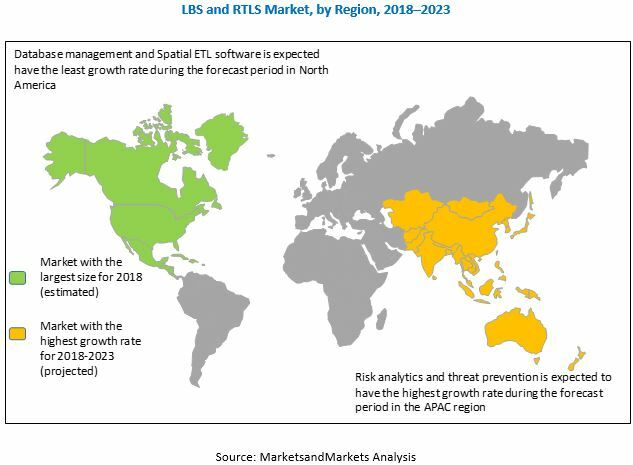 MarketsandMarkets estimates the global Location-Based Services (LBS) and Real-Time Location Systems (RTLS) market size to grow from USD 22.18 billion in 2018 to USD 68.85 billion by 2023, at a Compound Annual Growth Rate (CAGR) of 25.4% during the forecast period. The major factors that are expected to drive the growth of the LBS and RTLS market include increasing use of smartphones for advertisement, higher adoption of LBS and RTLS in various industry applications, and increasing use of social media advertising. In addition, investment in analytics technology boosts the market growth. The LBS and RTLS market is segmented based on component (hardware, software, services), location type, vertical, and region. In the LBS and RTLS market, the outdoor location type is expected to account for the largest market share. The LBS and RTLS outdoor location type plays a vital role in helping organizations enhance their business growth. It allows in-app purchases are purchases made from within a mobile application. The software segment is expected to have the largest market share, which is attributed to the fact that LBS and RTLS software acts as an interface between the location-based data and the final analysis of the data to create useful information for enhanced asset management. The application support and maintenance services segment is expected to account for the highest CAGR. Application support and maintenance services enable organizations to obtain an understanding of market trends, changing business conditions, customer insights, or service troubles, in addition to developing marketing and corporate branding campaigns. North America is expected to have the largest market share in the global LBS and RTLS market, owing to the presence of sustainable and well-established economies in the region, allowing it to invest in R&D activities. The US comprises majority of the LBS and RTLS market in the North America. In the US retail banks, LBS is used to collect volumes of customer-related insights. Analyzing these volumes of customer data helps banks to improve their relationship with customers. Retail, healthcare, eCommerce, and many other service providers are using context-aware technologies to advertise about their new offerings. Asia Pacific (APAC) is expected to grow at the highest CAGR during the forecast period, which is attributed to the fact that developing APAC countries such as India, South Korea, Singapore, and Malaysia have a large base of end-users, who are using LBS and RTLS solutions. The study measures and evaluates the major offerings and key strategies of the key market vendors, including Cisco (US), Google (US), IBM (US), Microsoft (US), Oracle (US), TomTom (Netherlands), Apple (US), Esri (US), Ericsson (Sweden), Qualcomm (US), Zebra (US), Ubisense (UK), Pitney Bowes (US), Baidu (China), Foursquare (US), Centrak (US), Ekahau (US), Galigeo (France), HERE (Netherlands), Teldio (Canada), Navigine (US), Living Map (UK), infsoft (Germany), AiRISTA (Maryland), and Quuppa (Finland). These companies have been at the forefront in offering reliable LBS and RTLS solutions to commercial clients across diverse locations.